flowers in the country, pineapples in Hawaii. you can ruin a good thing with obvious decor. 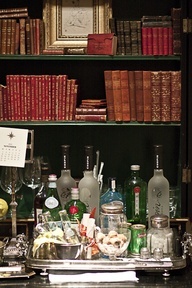 Keep '2013' to one place, not on every table and napkin! Nothing is worse than a yucky, sticky bar top! 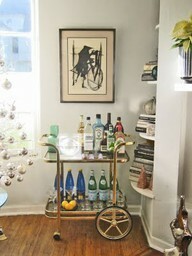 I love a fancy, vintage bar cart. 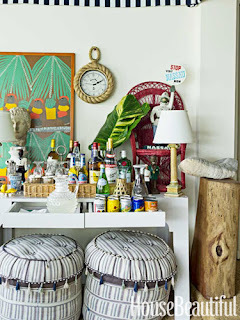 It's such a rare yet chic party piece. and then finally to the dining room with dinner wines. 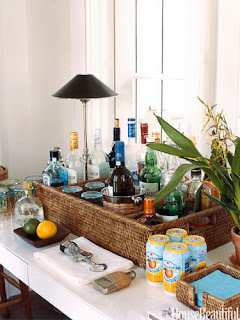 I love the potted orchid which always makes guests feel at home. And the sliced lemons and limes are a real treat. 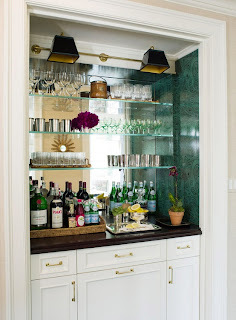 to a more prominent place so your guests can see it. and presents many more opportunities to put it! I love lots of silver during the holidays and New Year's Eve. or been given over time. in just white, red and green. without the clutter of too many choices. Don't offer the liquor store to your guests! Pick a couple drinks and let your guests choose from fewer options. 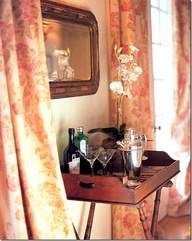 Use a tray or bedside table and offer a martini bar. believe me, your guests will find it. 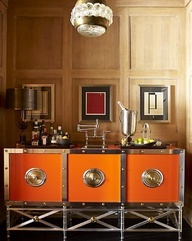 It's small but for martini lovers, much appreciated. and martinis ready at the pour. with pretty patterns, color and many friends.